Mennonite Girls Can Cook: Make it Beautiful. A lovely gift and decor shop in our area uses the above statement as it's logo. In cooking, as in home decor, you can also Make it Beautiful. How you plan, plate and present food makes such a difference. My mom loved to entertain. 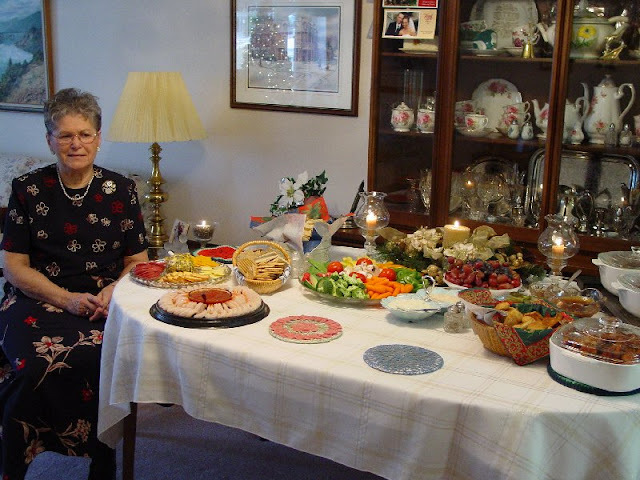 Although cooking wasn't her favourite pastime, she knew how to present food to make it look appetizing and beautiful. as to make it look gourmet and absolutely delicious. I'd like to share a few simple suggestions to keep in mind that will make your meal beautiful. First of all, don't save the special planning and presentation for special occasions. Making your every day meals attractive can tell your family that you think they're pretty special and it has the side effect of making the food seem even more delicious. We usually serve meals family style but once in awhile it is nice to plate a meal. This is a simple dish of fried chicken with potatoes, gravy and vegetables. 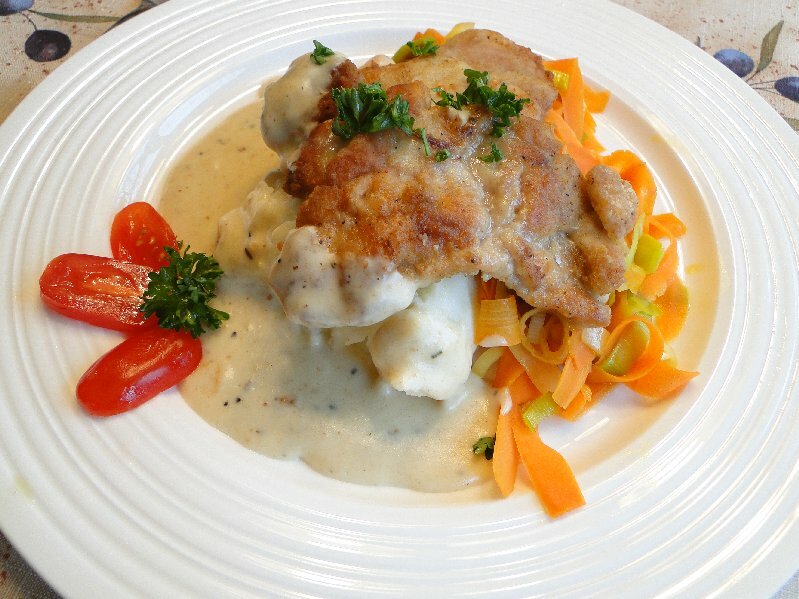 Using a potato peeler to prepare the carrots and arranging the chicken on top of the potatoes and vegetables brings a restaurant flair to the table. Consider colour as well as nutrition when planning a meal. Just imagine how unappetizing a plate of mashed potatoes, cauliflower and baked cod is compared to the crab cakes and salad pictured above. Use your pretty dishes and find ways to repurpose others to make your servings attractive. An example would be to serve beverages in mason jars or dessert in a teacup. Remember to include something brightly coloured on the plate. And take a moment to add a garnish, be it as simple as a sprig of parsley or a few fresh vegetables or as fancy as a carved radish or red pepper cut into a star shape. 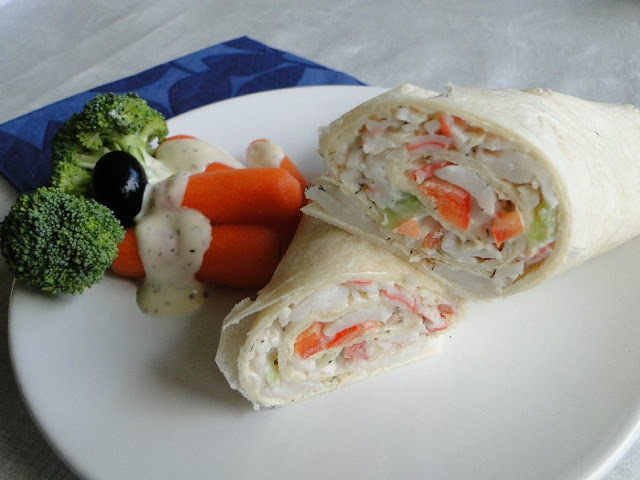 The picture above is of a simple crab wrap with raw veggies and dip but look how the veggies brighten up the plate and make it more appetizing. Set aside a few tablespoons of one of the ingredients for a garnish . 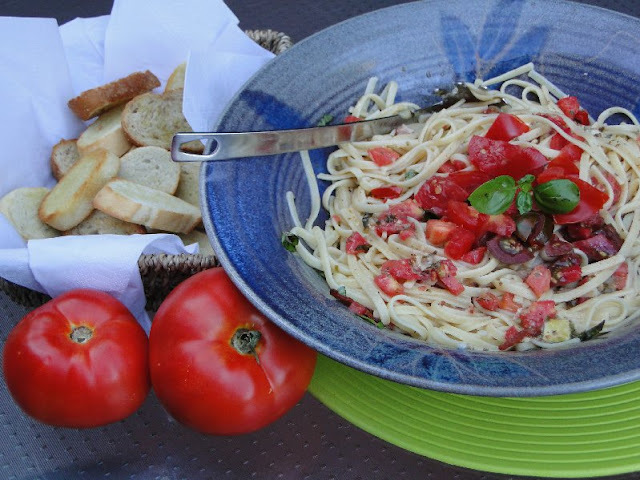 Many times this is all it takes to change a meal from looking ho hum to amazing as in the fresh tomato pasta above. 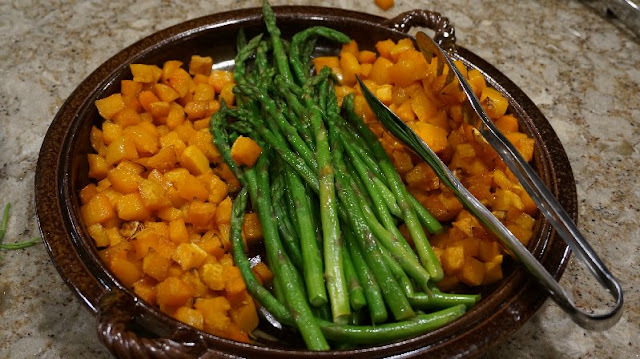 Sometimes just the choice of vegetables is enough to bring pizzazz to your table as in this squash and asparagus presentation. How you serve your meal makes a difference. 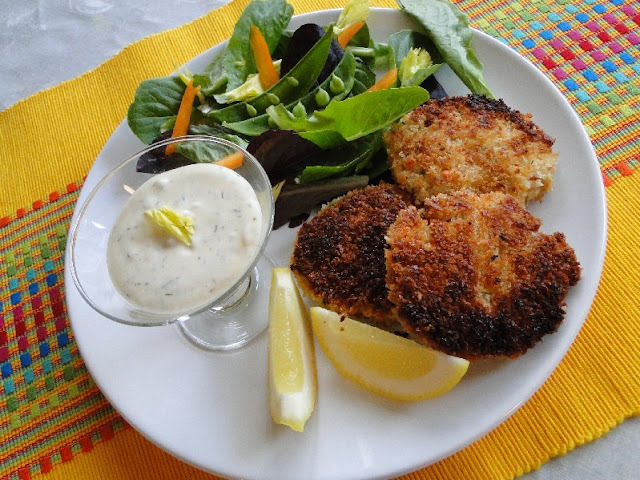 Find fun ways to change it up even for family meals. 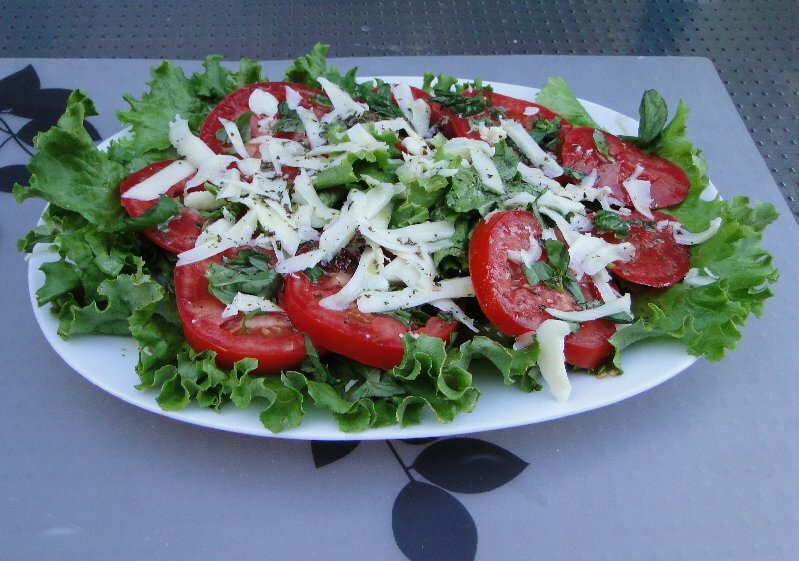 Serve spaghetti on a platter with the sauce heaped in the middle or arrange a salad to highlight the lovely colours of the ingredients such as the tomato mozzarella salad below. make it special for your friends and families. and brings compliments to the cook. it truly is easy to Make it Beautiful. Well how sweet is your Mom! And I agree that the table should look beautiful....my Mom is Polish and she would always make the table very fancy on special occasions. Polish people like to do that. I also love you Mom's china cabinet...very pretty. Another thought is, don't save the "good" dishes for good. I like to use them for ordinary meals, too, and not always be waiting for some special occasion. It's surprising what beautiful china can do for a hot dog! Very nice decorated - I would like to sit at your table! This is all so true! I like using different dishes and try to garnish more often. I pay attention to having various colors on the plate. I was told it's best to sue white plates show that your food presents nicely. We eat in our screened in porch when we can in the summer. I like to use table runners even for just us and change them with the seasons. Trying to collect more plates on pedestals so I have things at different heights when serving a group. Thanks for your tips, Cindy - they are all great ones.